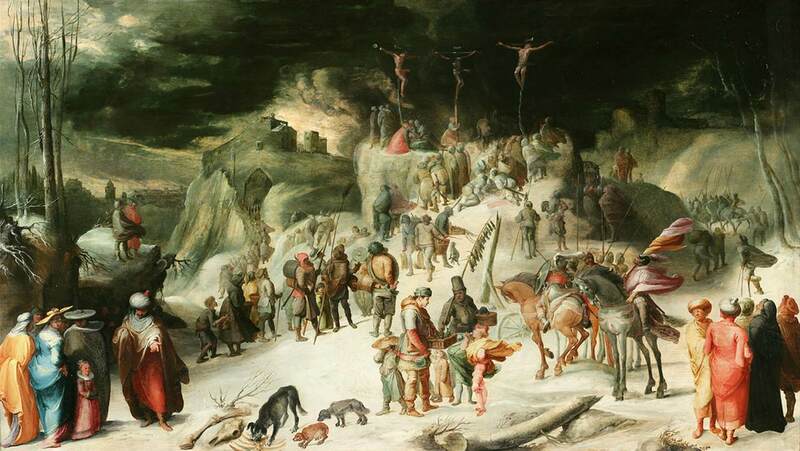 Though this painting is based on a work by Lucas van Leyden dated 1517, Karel van Mander uses this inspiration to create what is likely the first painting of the Crucifixion depicted with snow. Van Mander was following a tradition started by fellow Dutch painter Pieter Bruegel the Elder, who, about thirty years prior, had done a series of biblical paintings set in the Dutch winter. Due to the virtual disappearance of religious painting from the Protestant society of the Netherlands, preference had shifted to non-religious themes such as still life and landscape painting, and Bruegel had started a vogue for Netherlandish winter paintings. Dark skies and snowy hills dominate this landscape of Golgotha. Banners and cloaks billow in the winter wind while hungry dogs scavenge the bones of dead animals littered among barren trees. As the mortal life drains from Jesus, the earth itself waits, dormant and lifeless. Van Mander, with his use of stark contrast between sky and snow, was able to produce a stunning landscape depicting a Flemish winter, and still capture a scene charged with more emotional resonance than many of Bruegel’s preceding works. Karel van Mander, the Elder (1548 - 1606) was a Dutch Mannerist painter, poet, and writer whose fame is principally based upon a biographical work on painters - Het Schilder-boeck (1604; "The Book of Painters"). Born of a noble family at Meulebeke in Flanders, van Mander studied under Lucas de Heere at Ghent, and under Pieter Vlerick at Courtrai and Tournai. After much wandering, in 1583 he settled at Haarlem, where he co-founded a successful academy of painting. Van Mander's paintings, which were mainly religious and allegorical, adopted the elongated forms of the Mannerist, but his later works showed a greater tendency towards naturalism.